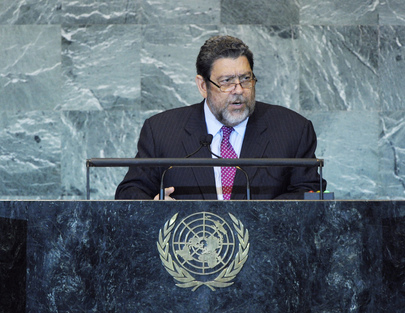 RALPH E. GONSALVES, Prime Minister of Saint Vincent and the Grenadines, said winds of change had encircled the globe in recent months, reaching and reshaping its unlikeliest corners, for good and ill. As a result, the United Nations found itself in the eye of increasingly turbulent geopolitical and socio-economic storms, and its response to those howling gales would determine both the contours of the post-crisis world and its relevance as an institution. Noting the current debate’s focus on mediation, he said the difficult work of negotiation and peaceful dispute resolution was too often abandoned for the “quick fix” of militarism, brinksmanship or ill-advised unilateral action. Yet, the role of mediation in the settlement of disputes was more than a theme; it should become a firm resolution during this year’s session. Among other things, that resolution should embody an international commitment to exhaust peaceful methods of dispute resolution, to narrowly define military interventions and to strictly adhere to Security Council mandates for such action. As such, it would mark the beginning of a break with the vicious, yet oft-repeated cycle of unilateral interventionism and its unfortunate long-term consequences to the local victims and the international community. He said that, with the world well into the third year of the international economic crisis, it was now possible to declare that the tepid and timid responses of wealthy developed nations had failed to heal the global economy. Small, vulnerable and highly indebted middle-income countries could not afford to wait for the promise of incremental or cyclical upticks in the world economy. Small States needed the fiscal and policy space to creatively spur development in ways that complied not with the checklists of discredited economic theories, but with real-world particularities and people-centred politics. Further, the General Assembly must reassert its role in responding to the economic crisis, including by following up on the unfulfilled mechanisms and recommendations spelled out by the United Nations Conference on the World Economic and Financial Crisis and its Impact on Development. Recalling the impact of Hurricane Tomas on his country earlier this year, he underscored the continuing vulnerability of small island developing States during the current Atlantic hurricane season. He remained baffled by the intransigence of major emitters and developed nations that refused to shoulder the burden for stopping climate changes that were linked to the excesses of their own wasteful polices. The world’s “dance with global disaster” must end this year at the next climate change conference in Durban, South Africa, he said. Similarly, as the world returned to Latin America next year for the United Nations Conference on Sustainable Development, or “Rio+20”, it must accept two inescapable truths: First, that promises made must be kept, and, second, that while talk is cheap, development is not. It was no longer possible to pretend that meaningful global development was possible without the commitment of new resources, in addition to the realization of previously unfulfilled pledges. Continuing, he said it should be a source of alarm and international embarrassment that the composition of the Security Council was an ossified relic of World War II, seemingly immune to modern realities. His Government called for the Council’s reform, including an expansion of permanent and non-permanent members with full regard to Africa’s aspirations and the necessary accommodation for small island developing States. Also, his country was honoured to serve as co-facilitator for the Working Group for the Revitalization of the Work of the General Assembly. Turning to other issues, he noted the declaration of the International Year for People of African Descent, stressing that that group remained systematically and individually disadvantaged. The famine in East Africa, as well as its attendant refugee and security problems, required urgent attention and massive response. In addition, the international community must redouble, rather than reduce, its support to Haiti. His Government had no doubt that Palestine’s membership application would resuscitate the moribund negotiating process between it and Israel. It also believed there was no place in the modern world for the anachronistic embargo of Cuba and that Taiwan’s request to participate in the specialized agencies of the United Nations was reasonable.